When does it make sense to use one over the other; when does it make sense to use both? Offloading appropriate work to LP360 will reduce the overall software stack cost per user. Taking advantage of each package’s unique strengths appropriately will increase efficiency and throughput. A well-trained user can produce a quality product in either package. For inexperienced users, learning curve for LP360 is much lower than for MicroStation/Terrasolid. Generally, CAD-based technicians are harder to recruit and cost more per hour than GIS-based technicians. TerraScan architecture is based on reading all points into memory, providing 100% availability, but requires a file-based approach to project management (only one file open at a time for editing). LP360 architecture is based on using pyramiding to provide point cloud overviews of entire project. % availability can vary, but single file-based editing is not required. 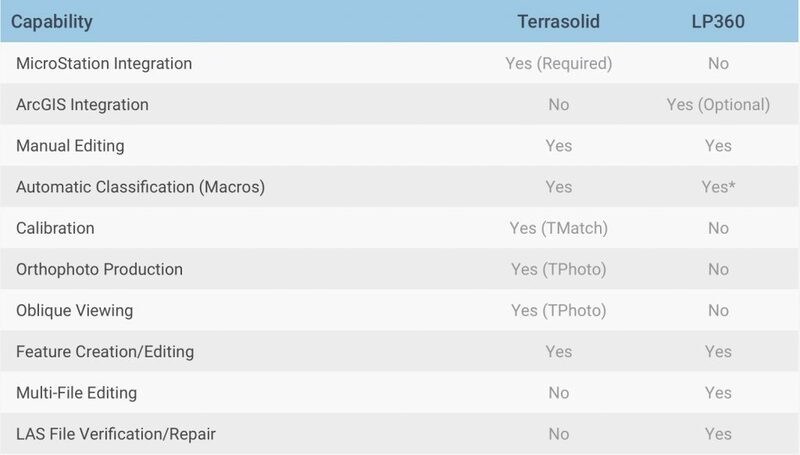 TerraScan can be supplemented with tools for calibration (TerraMatch) and orthophoto production (TerraPhoto). TerraPhoto supports oblique imagery for mobile mapping. LP360 has built-in QA/QC reviewing tools and more powerful tools for performing LAS file verification and correction (LAS File Analyst). Feature editing/ compilation can be very user-preference driven, but there are noticeable differences between the two toolsets. Breakline compilation for hydro-enforcement is streamlined in LP360. Tools are more user-friendly (subjective). More options for controlling the conflation process. More QA/QC tools that work directly on the features themselves.